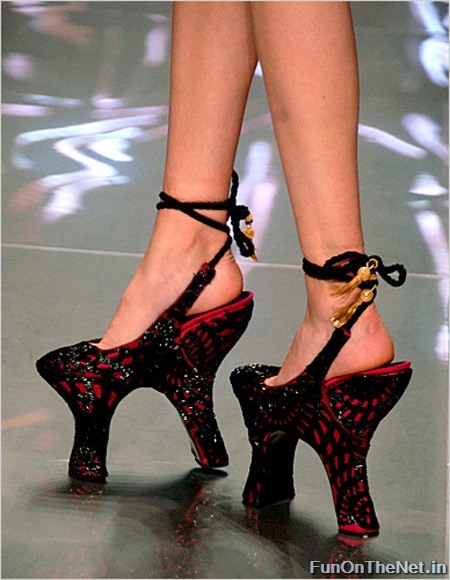 Here are some of the most creative and weird high heeled shoes! 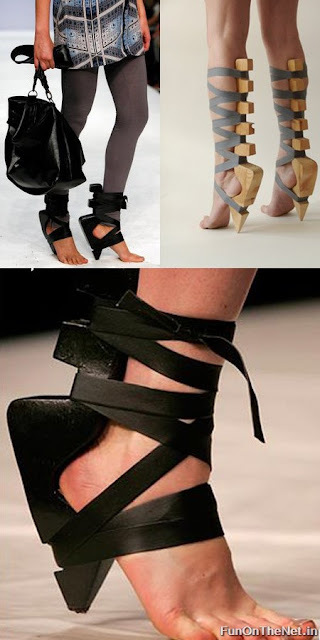 From a shoe with no sole to a shoe with two heels and even shoes with inverted heels! Julian Hakes designed these fascinating shoes with no sole. The support is there, though, for the heel and ball of the foot, which forms a natural bridge between the two. In the course of designing, he had tracing paper and masking tape on his foot, drew the patterns, and then used a scalpel to cut it off. 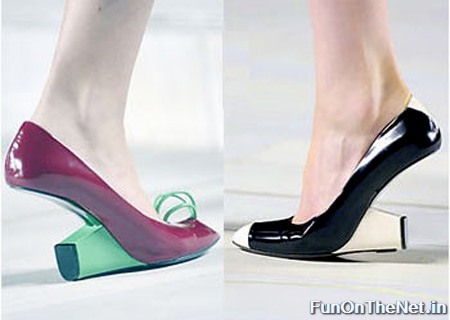 Inverted Heel Shoes, by Marc Jacobs. 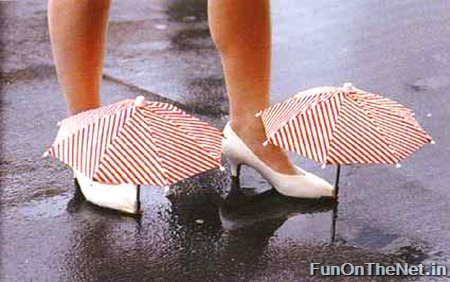 The Umbrella Shoes can protect your feet and shoes from rain. Designed to look like a modern high-chair, this high-chair heels take your feet 6 inches off the ground so they sit almost vertical. It's a fashion accident waiting to happen. These Dior shoes were worn by Marion Cotillard at the Bike In-Style challenge winner announcement and awards ceremony at the LVMH Tower Magic Room on June 2, 2009, in New York City. The price? $1600! Maki Aminaka (Löfvander) and Marcus Wilmont (Aminaka Wilmont) introduced their sole-less shoes in London during the 2008 London Fashion Week. With a good pedicure, anyone can carry off this look. Bottle Opening Shoes, the perfect party shoes. 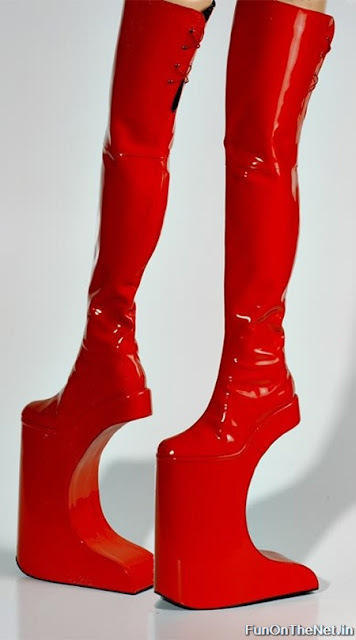 These give platform shoes a new meaning. 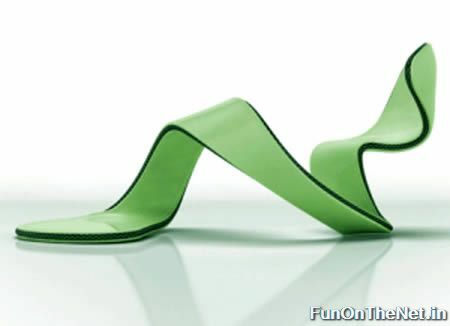 Origami (paper) Shoes, by designer Catherine Meuter. What's better than shoes with a high heel? 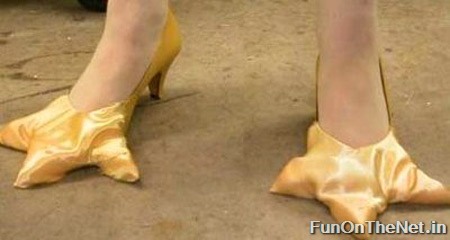 Shoes with two high heels! This shoe is just totally versatile. 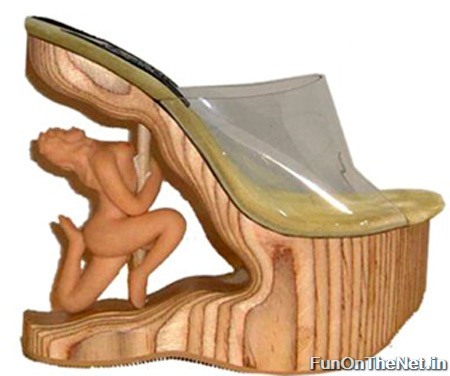 The naked lady who forms the heel of this shoe appears to be writhing orgasmically against her pole. The price? $175. Lolll. I would never rock any of them. Thats why its weird and disgusting..there are some who could push boundaries..